I used: DCWV (Latte stack), Sharpie, Nailheads. I used: DCWV cardstocks (Tahtii beach stack), Fiskars border punch, Imaginisce I-Top, Sharpie. 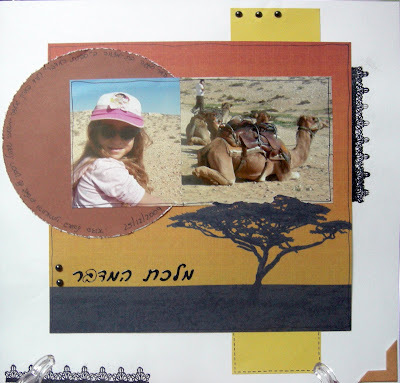 The journaling says: Omer celebrated her Bat Mitzva in "The Desert Sheep". We rode on camels and experienced Bedouin hospitality. 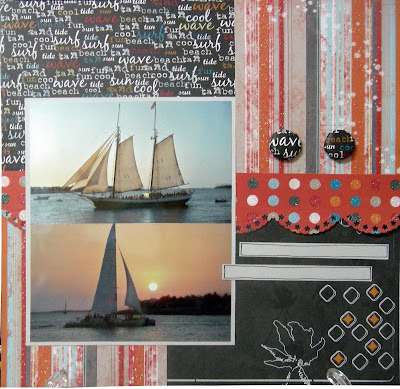 I used: Miss Elizabeth's cardstock, Sonburn cardstock, DCWV (Safari Chic stack), Nailheads, Unity stamp, Ink it up! 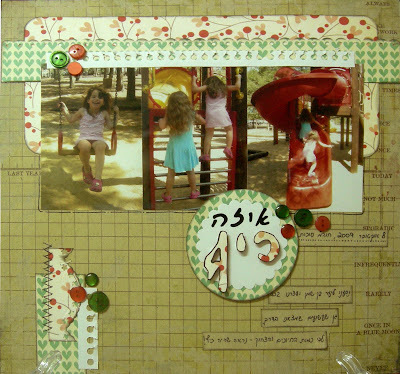 black ink, embossing powder, Sharpie, We R memory keepers (corner chipboard), Hebrew letters. I used: DCWV (Summer Stack solid cardstocks & Spring glitter chipboard), Coluzzle (to cut the half circle border), Fiskars circle cutter, We R Memory Keepers (corner chipboard), Unity stamp + Ink It Up black ink + embossing powder, bottle cap, button, eyelets, stapler, Sewing machine. 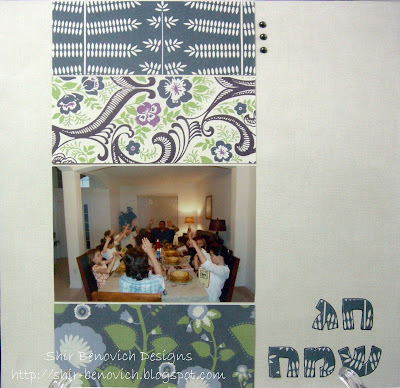 The journaling says: October 8th, 2009, Sukkot. We went to Ben-Shemen forest and stopped at every park we found on our way. According to the amount of simles & laugh - It looks like fun! I used: Paper: My Mind's Eye (Be Loved: Beautiful Branches & Sweet Hearts, Life Stories: Frequency Grid), Ink it Up! black pigment ink, Fiskars border punches, Cuttlebug + Spellbinders Nestabilities dies, Stapler, Sharpie, buttons. I got these pages with November Kit for Scrappers of Unity Stamps.